Getting started is easy. 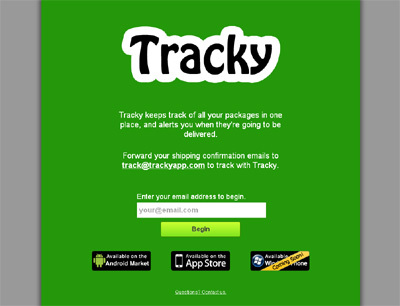 Just forward your shipping confirmation emails to track@trackyapp.com and Tracky will track them for you automatically. Then open the Tracky app to quickly see the status of all your packages. Customizable email and text message notifications will keep you up to date on your package’s status. And Tracky will let you know on the day your package will be delivered, and once it has been delivered to your door. Faster, simpler, and easier to use than any other package tracking app.